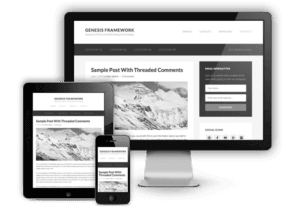 If you build WordPress sites for a living, like we do, chances are you’re either using, have used, or have had to work with the outstanding line of Genesis Framework themes by StudioPress. The Genesis themes come with built-in widget areas, tools, and great ‘hooks’ to exercise your programming chops on – but occasionally you run into a problem or customization where it’s not obvious what you’d want to do. One of my favorite themes is Minimum Pro, and I’ve based a number of client sites off of it. In this tutorial I’m going to show you how to quickly and easily convert the Minimum Pro site-tagline region to a widget area so you can insert menus, buttons, search bars or whatever else you may need to please that demanding client. This line is responsible for including the Genesis hook of the ‘site-description’ tagline attribute on the left side of our tagline, under the header. 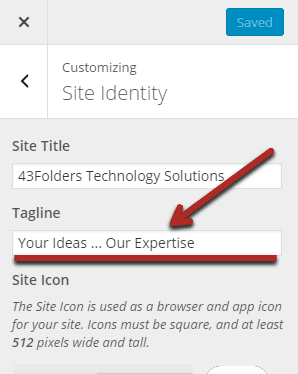 You can set this in the customizer, under the ‘Site Identity’ menu (see image A). That tagline can be used anywhere else you want, simply by adding a line similar to the one that we just deleted. One of 43Folders’ custom themes inserts it into the footer, along with some social media icons, for example. Now that we’ve removed the default Genesis theme usage for that space, we’ll want to replace it with our new widget area. For that to occur, we can use the predefined Genesis function for registering widgets, aptly named genesis_widget_area. Insert that code right where the old code was deleted, and add an ID that you want to use as an argument. We’ll add additional code later, also in functions.php, that will make use of this so make sure it’s something that makes sense and you’ll remember. The last thing left to do to is actually register that new widget when WordPress loads. The genesis() page function runs on load, and when it does it will cycle through all of the genesis_register_sidebar arrays, so we’ll need to add one of those with the same ID as we defined earlier (I did tell you to remember that ID, didn’t I?). At this point, once you’ve saved the file the work is done – you’ve just created and registered a brand new Genesis theme widget! There’s one last thing we need to do – go into our custom style sheet (you are using a custom style sheet, right?) or style.css and update spacing and size of the areas to match your needs. Really, that’s all there is to it … a little PHP, a dash of CSS and you can add widget areas to any of the Genesis Framework themes! If you need some help making this happen, or would like to schedule a call to discuss redesigning and re-envision your current site don’t hesitate to contact us today for reasonable rates and professional updates. I’d love to get any suggestions or feedback in the comments section too!